In tribute to Australia Day! Saturday 26th January is Australia Day and so in preparation for this extremely important day I thought we’d have a week of Australian wines as my own personal little tribute. 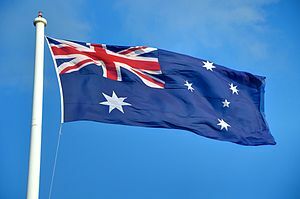 It may seem a strange day to mention at all (since I’m not Australian) but as far as I’m concerned Australia Day is pretty much the most fun day of the year in terms of public holidays. Except for maybe Christmas. And yes I am aware the Australia Day is not actually a public holiday in this country (for obvious reasons) but you know what I mean. It all began in our first year of university, I think mainly as an excuse to go out and party with hot, drunk Australian men, and turned into some kind of yearly tradition. I have just unearthed a lot of really really bad photos of Australia Day 2007 on Facebook which I was going to put up here as an example but they really are that bad and let’s face it, it’s hard to look good when you’re dressed in an Australian flag and have spent 10 hours in the Walkabout drinking cheap white wine. But anyway, I would encourage everyone to embrace the day the good news being that this year it falls on a Saturday so you’ll have the whole of Sunday to recover. To change the subject slightly, Sainsbury’s is driving me MENTAL! You would think a half decent Australian Chardonnay or Shiraz wouldn’t be too much to ask for from a big Sainsbury’s but there was NOTHING! So I’m going to start with my Sainsbury’s wine as it was such complete dross that I just want to get it out the way. Redbridge Creek Shiraz is from South Eastern Australia and at £6.99 is part of the Sainsbury’s Taste the Difference range. Now firstly this is perhaps the ugliest wine label I’ve ever seen but I was at least encouraged by the fact that the wine is made by De Bortoli which is a really well respected wine company. The nose is overwhelmingly plummy, not fresh plums but the kind you might get in an industrial strength air freshener. We once had a dead rat in the ceiling of a shop I was working in and the rat man left an unbelievably strong plum flavoured air freshener to cover up the smell – to this day really artificially plummy smells in wine remind me of that dead rat. While you could call this wine easy-drinking it is worth remembering that that is one thing Shiraz is not supposed to be – it should be full-bodied and chunky and the kind of thing you can have with a barbecued steak. Essentially it therefore means that this wine tastes cheap; there is fruit, a bit of spice, but none of the dark chocolate flavours I was desperately looking for and no depth or concentration whatsoever. If this had cost but £5 then it would be one thing but it cost £7 and as far as I’m concerned that is just unacceptable. Luckily I had much more luck in Tesco. From the Tesco Finest range I bought the Block 13 Viognier Marsanne Roussanne from McLaren Vale in South Australia. This was £8.99 and worth every penny, a really delicious wine. Viognier, Marsanne and Roussanne are white grape varieties all originating in the Rhone region of France which have been planted to great success in other parts of the world. Each grape brings something different to the table stylistically and has in this case produced a wine with a distinctly tropical fruit nose of bananas and apricots. The palate is citrussy, spicy, with a clean mineral streak. The wine is fresh, dry and medium bodied and would be a great match for all manor of fish dishes, especially anything that has a bit of spice to it. It would also work well with something a bit more hearty like a chicken casserole. I wondered into Vagabond in Fulham a few days ago. For anyone who gets nervous about spending a lot of money on a bottle of wine they haven’t tried before (don’t we all), this is the place for you. Similar to The Sampler in Islington and South Ken, they have around 100 wines that are available to taste (either a small tasting sample or a full glass) at any one time making it something in between a shop and a wine bar. I’d been in before but had never had time to stick around to try anything. The whole process is my idea of heaven and dangerously easy; you have something similar to an Oyster card that you put money on and then serve yourself directly from the machine. Prices vary hugely but the point is you can buy a sample or a glass of a £50 wine making the more expensive range much more accessible to the curious, but not necessarily wealthy, wine drinker. The wonders of technology and the enomatic machine! I tried two wines: the Listening Station Chardonnay from Western Australia for £8.99 (sample was 70p) and the Mitolo Jester Cabernet Sauvignon from McLaren Vale for £14.99 (sample 90p). Honestly I found the Chardonnay quite disappointing and in my opinion overpriced. The Cabernet was delicious however with great complexity and depth of flavour. The nose was full of blackcurrant, dark chocolate and sweet spice; on the palate flavours of black pepper, cloves, black fruits and currants with very ripe tannins. It could probably benefit from a couple of years further bottle ageing and definitely some food (this needs lots of red meat to stand up to it) but was still delicious to drink now. My only complaint about Vagabond was that the samples were a little stingy. You could only really get one and a half good sips out of what you’re given which I don’t think is quite enough (I like at least 2 proper sips when tasting wine). Other than that it’s a fantastic shop with some really exciting looking wines, I will no doubt be back very soon. So there you have it, a plethora of options for your Australia Day celebrations and a very good excuse for a night out this weekend. Enjoy!